Me and Łukasz just came back from San Francisco, California. Wikidot entered AWS Global Start-up Challenge 2012 last November and we were happy to be selected a finalist with an opportunity to compete for the Grand Prize on 23-24 January 2013. 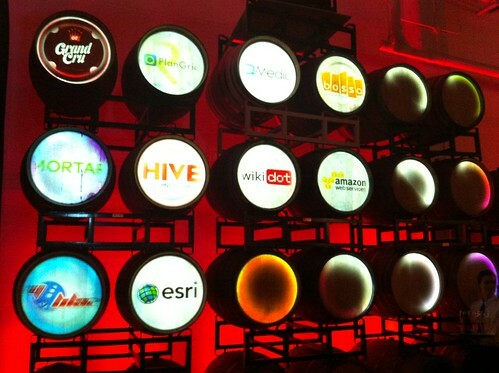 Logos of all finalists displayed on barrels of wine during the finale. Nice. The challenge itself was awesome. The final round consisted of a presentation in front of the judges — top AWS executives. During the finale in Dogpatch Wineworks we had a chance to present Wikidot to over 500 attendants. The other contestants were so great we felt no huge regret not winning the Grand Prize. Wikidot was among the twelve very top competitors chosen from 2,500 entries from 85 countries and this is what mattered for us.